The last batch of ink reviews took a long time to work through. The next batch may take even longer. I won’t give excuses here, suffice to say that real life has intruded a lot recently, and this blog has had to has had to slip down my priority list. That doesn’t mean that I’m planning to give up any time soon, but I need to be realistic about the amount of time I can spend on the blog. 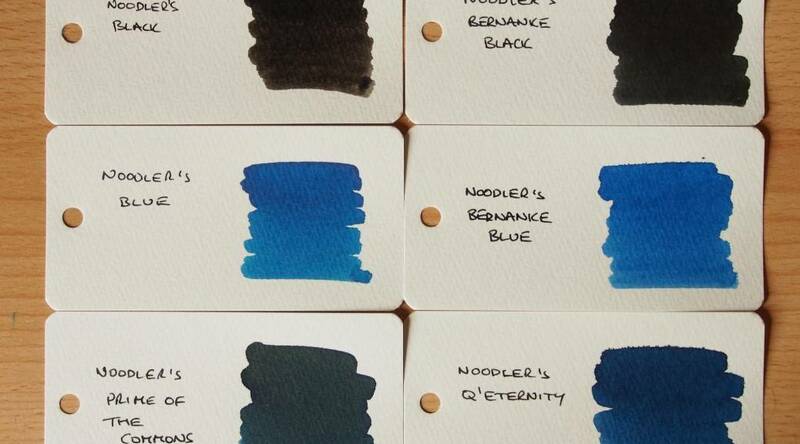 The next batch of ink reviews are for more sombre, businesslike inks. Maybe the choice reflects my state of mind, and a couple of inks will be a challenge to review and keep the momentum going. Just inking up the pens and doing short writing tests show that I will have trouble finding positive things to say about some of them. However, my long term aim is to review every ink that I have in my collection, so I can’t shirk the ones that will be a slog. I will say that there is also an ink in this batch that I really like – so it’s swings and roundabouts to an extent. One other thing that I should mention is that a pen manufacturer has kindly offered to loan me a few pens to review. The pens should arrive over the next couple of weeks and when they do I will interrupt the ink reviews to concentrate on the pens. More details will follow when the pens arrive.